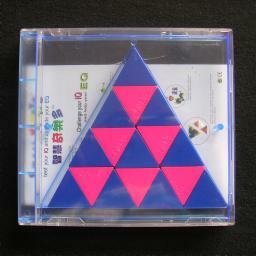 The Kinato puzzle consists of a chain of 16 equilateral triangles connected at their corners. The triangles come in two colours, 6 of one colour, 10 of the other. 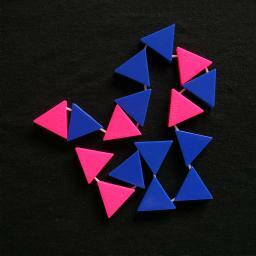 The aim is to put the pieces in the shape of a large size 4 triangle, so that the colours form a kind of checkerboard pattern or any of the other 29 patterns shown in the booklet. The connections between the triangles allow very free movement, allowing a triangle to be turned over and placed in any position as long as the connected corners are adjacent. Note however that the chain cannot cross itself (as it would no longer lie flat). The diagram below shows the arrangement of the colours on the chain of triangles. If they are numbered from 1 to 16, then the triangles with numbers 1, 3, 7, 9, 15 and 16 are of one colour, the rest of the other colour. Below are the 30 puzzles that are given in the instruction booklet. It is often remarkably tricky to solve these patterns. Kinato was patented on 18 July 2002, WO 02/055169. Jeruel Industrial Company, the original manufacturer of the Kinato. Shows the Smart Kinato, as well as newer Hexagon puzzles. Mèfferts has the Kinato for sale. Here are solutions to the 30 problems from the instruction booklet. These solutions are not always unique.